The High Tiber Valley, or Valtiberina, is the easternmost edge of tuscany and gets its name from the river that crosses it throtughout its length, to the border with Umbria. 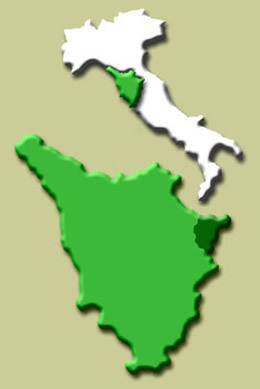 The Valtiherina was border and at the same time point of encounter between different civilizations, the Umbrian and the Etruscan, the Byzantine and Lombard. The bishops of Arezzo, the "Signori" of Rimini and the Montefeltro, the popes of Rome and finally the Florentines fought for centuries over these mountains and this valley. The Roman patricians at the time of Augustus discovered the beauty of the area and built several villas. Then came the feudal lords and abbots who erected sturdy, bold castles and monasteries, followed by saints who found suitable sites tu satisfy their mystic thirst. Michelangelo, a native of these mountains, had the gift of perceiving life in the cure of a stone block just as Piero della Francesca in his birthplace, Borgo San Sepolcro, had already understood the secret of light and space and translated it onto paintings. In its variety of architectural styles, in its uses and habits, in its craft products, in its own language Valtiberina reveals multiform influences coming from Romagna, Marche and Umbria, and contributing tu the excentric character of the valley when compared to the Tuscan context. 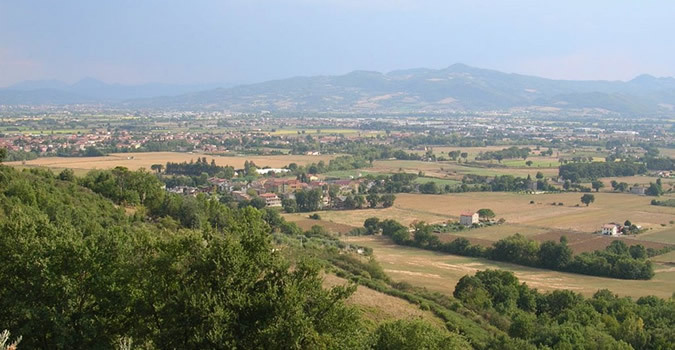 The traditional transit difficulty between the two slopes of the central Apennines has contributed to the relative isolation of this valley where Sansepolcro played the role of the city endowed with its own physiognomy and cultural autonomy. Intact walled towns like Anghiari or river centers like Pieve Santo Stefano, Camaldolesian abbeys and Franciscan convents, medieval country churches and castles narrate the history of this charming universe and point the stranger to most suggestive and varied itineraries. The Upper Tiber Valley is traversed in its entire length by Motorway "Tiberina 3" and by Motorway (Superstrada E 45) which connects Rome directly with northem ltaly, crossing the Apennines just at the point where the Tiber rises. 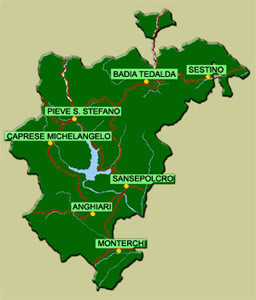 Numerous roads link the area with Arezzo, the Valdichiana and Casentino to the west, Romagnn to the north and Montefeltro and the Adriatic coast to the east.